The Amish Flat Top Desk with Solid Wood Raised Panel Back is a handcrafted classic that continues to shine. Combining just the right amount of style and substance, this solid wood desk works hard, looks great and maintains its value over time. 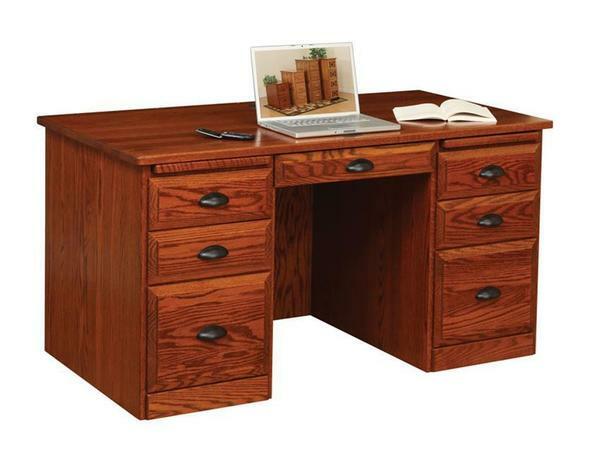 Investing in solid wood office furniture of this magnitude is sure to serve your home or office well. Avoid wasting time and money on desks that have to be replaced every few years. DutchCrafters Amish made furniture brings forward heirloom quality, functional furniture with custom features to best fit your needs! This Amish desk is available in five custom sizes ranging from 42" to 68" wide and shows off a simple country style that is relaxed and welcoming, yet professional through and through. DutchCrafters desks are the most highly customized pieces of solid wood furniture we offer. Select your wood and stain options and consider added features like drawer locks for added security or inlaid leather writing pads to work at. Order stain samples to work with and feel free to contact us to match a stain to your existing office furniture. We can be reached via email or toll-free at 866-272-6773. Width: 42", 50", 56", 62" or 68"
Kneehole width for 62" & 68": 27"